HIRST GETS THE DOUBLE AT THE BUNBURY 400 | Talking Speedway, Speedway news from around the world! “The California Kid” Kyle Hirst has dominated round 11 of Enzed World Series Sprintcars by winning not just the A Main for the feature race but also the 360 Sprintcar feature as well at the historical 400th round of World Series Sprintcars at Quit Bunbury Speedway. Monte Motorsport team owner Luch Monte made the call early last week to for Kyle to run both divisions which is something he is accustomed to in his native California, and after governing the 360 A Main, went on to lead from start to finish of the World Series feature in identical fashion. 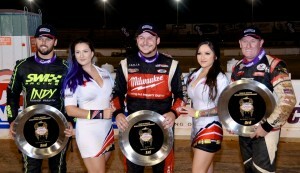 “We came here with two cars and got both wins, so it couldn’t get any better,” Hirst said, enjoying the spoils of getting the double, and when asked if the extra track time gave him an advantage, the smiling assassin conceded that it was great track time. “We were on the track all night long, and it seemed like I was doing heat race after heat race, but then again you don’t always know what you’re going to get but Buzzy picked hard tires and that let me go as hard as I wanted and not worry about them blowing out like what happened to James,” he said referring to James McFadden’s last corner lunge around the top side while running second, that came to a crunching holt when his right rear tyre exploded. “We’ve been doing it long enough now, that you understand that this is just the way it rolls. We’re not sure why we’re losing so many races to blown tyres but anyway, we had great car speed and we’ll just keep trucking,” McFadden said, amazingly still carrying a smile. Jamie Veal bounced back in the possible fashion from his very forgettable run at Albany by securing Revolution Racegear Quicktime and after both rounds of heats, had clawed back Brooke Tatnell’s series points lead to 50, and after running second in the Amain ahead of Tatnell in third (who’d come from ninth,) was able to salvage yet another 30 points to trail Tatnell by just 20 heading in to the two-night Grand Final at the Perth Motorplex next weekend. 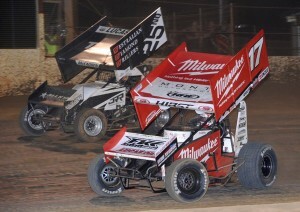 Ryan Farrell was the best of the locals claiming fourth after starting seventh with Steven Lines rounding out the top five and keeping in the hunt for the series should Veal and Tatnell experience any misfortune in the final round. Luke Dillon claimed the Hoosier Hard Charger after qualifying an uncharacteristic 16th out of 24 cars and started the feature from 14th and advanced to 6th. This entry was posted in Australian Sprintcar Championship, Sprint Cars, World Series Sprintcars by admin. Bookmark the permalink.